The following commands will show current event destinations; create a new destination called ‘syslogger’ to send to our syslog server on 10.0.0.1; show the current event config; set the CLI to not paginate the output for the next bit; show event routes for all 6908 events; add syslogger as a destination for all 6908 events; verify the event routes are modified; test we can ping the syslog server; set to diag privilege level; get the output of ‘event config show’ at diag level (there’s much more there in diag); then generate an event to test the syslog server is receiving messages. Important note: The next line will add syslogger as a destination for all 6908 events. Without more testing/investigation on my part, this might not be a good idea to do on a production cluster. If you can decide which events you want to route to the syslogger, that would be advisable to do, but with 6908 possible events it’s not easy to choose and there’s no options in the 8.2 CLI to just route say CRITICAL events to the syslogger. Please see the Appendix A for my reasoning on this! Kiwi Syslog Service Manager is very easy to install, download from http://www.kiwisyslog.com/free-edition.aspx and run the installer. Once it is installed, go to the file menu and Setup. 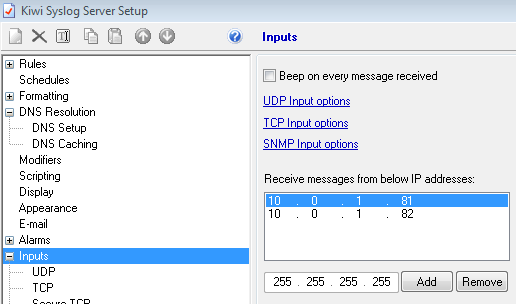 In the Inputs > UDP section: check the ‘Listen for UDP Syslog messages’ is ticked and enter the ‘Bind to address’ of the Syslog server. Then click OK to the ‘Kiwi Syslog Server Setup’ window. Verify firewall policy allows UDP connection from the node-mgmt LIFs to the syslog server on port 514. The reason why I can’t recommend is that I managed to break the SIM. When I added syslogger as a destination for all event routes, quite rapidly the root volume filled up. Now, this was on a SIM and only a 1.6GB root volume, the minimum on a production system is 250GB, so this is very unlikely to happen on a production system, the logs should cycle well before it becomes a problem, this is just a word of caution. - were generating roughly 1 every 5 minutes, or 20MB a minute. This soon filled up the SIMs root volume! If you get the above problem on a production system, call NetApp Support straight away and log a P1, the notes below are simply down for my own convenience! Caveat lector!!! There is probably a very good reason why not to set the root volume snap schedule to 0 0 0, and not to set the snap reserve to 0, one to investigate further!